A must have accessory for anyone who wants to keep the screen of their Galaxy S3 looking like new. 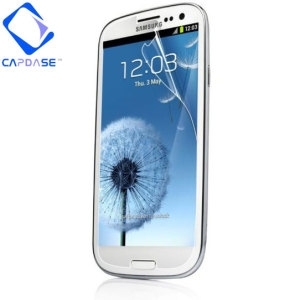 The AUMI Screen Protector keeps your Galaxy S3's expensive and fragile screen from damage and scratches. Impact damage from keys, coins & pens can damage fragile LCD screens and can cause expensive repair bills. The AUMI scratch resistant coating protects from daily damage, whilst providing exceptional durability even during extended use. AUMI Screen Protectors are exceptionally clear and are designed to allow the maximum amount of light through them without distorting the colours on your screen. An anti-reflective coating means that you won't be distracted by your reflection or bright sunlight while trying to use your phone. The gently textured finish on all AUMI Screen Protectors makes them perfect for using with touch screen devices. They also have a special coating that helps eliminate fingerprints and unlike most screen protectors don't get oily during use. AUMI screen protectors have been designed with touch based phones in mind. They are thick enough to protect your screen, but thin enough so as not to interfere with capacative or resistive touch screens. Fingerprint, Oil & Reflection resistant.